The government of debt-choked Cyprus, which has been negotiating with international lenders for a financial rescue, on Tuesday called for a one-day delay in voting on a plan to seize part of depositors' checking and savings accounts, the Associated Press reported. Members of the island nation's ruling party, meanwhile, said they would abstain from any such vote, virtually guaranteeing the defeat of any plan to take money from Cypriot bank depositors. On Saturday the Cypriot government agreed to raise the €5.8 billion ($7.5 billion) needed to secure a €15.8 billion financial rescue from the International Monetary Fund, the European Central Bank and the European Commission, known collectively as the troika. It decided that it would raise the money by expropriating as much as 6.75 percent of the balance on deposits below €100,000 euros and 9.9 percent on accounts larger than that. Nicosia agreed to the fundraising because the troika, which is under pressure from Germany and other creditor nations in the euro zone to tighten conditions for bailouts, demanded such terms. 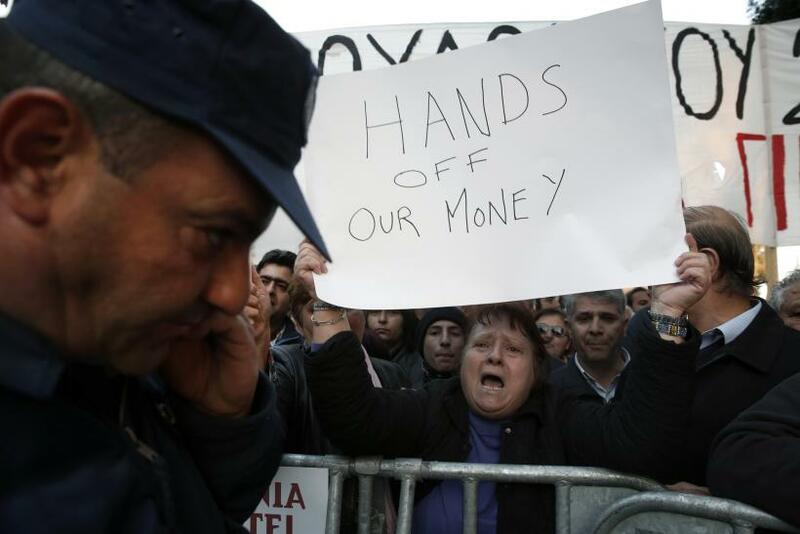 However, when news of the plan became public, Cypriots rushed to automatic teller machines to withdraw as much of their money as they could to protect it from the proposed government grab. On Monday banks were closed for a holiday so depositors could not line up to withdraw all their money. Fear of a bank run has led the government, which headed by Nicos Anastasiades, to keep banks closed until at least Thursday. The uproar over the proposal was not just domestic. Global equity markets have been falling since early Monday, and gold has been rising. Further, the troika's demand that individual savers bear some of the burden of their bank's rescue marks a departure from its earlier rescue of such nations as Greece, where savers were spared any impact from that nation's bailout. The concern of many is that the troika will respond to future requests for bailouts by insisting depositors surrender some of their money. If that is the case, it could result in bank runs in Italy or Spain, should those countries need a bailout. Indeed, over the weekend the chief economist of Germany's Commerzbank said a one-time levy on Italian bank accounts would "make sense," according to Handelsblatt. "A tax rate of 15 percent on financial assets would probably be enough to push the Italian government debt to below the critical level of 100 percent of gross domestic product," the economist suggested. As a result of the blow-back and fears of bank runs, Greek lawmakers revised the plan so it would spare savers with less than €20,000. However, some lawmakers also said the revised plan falls about €300 million short of the €5.8 billion demanded by the troika, according to the Wall Street Journal. A vote on the revised plan was delayed one day, partly because of Anastasiades' tenuous grip on power: His Democratic Rally party holds only 20 of 56 seats in Parliament so he needs a coalition to ram through the plan. With many of his party members vowing not to vote on the revised plan, its defeat is virtually assured. Meanwhile, Market News International reported that Sarris offered his resignation. Greece's Ekathimerini.com news site said Tuesday that Sarris would be replaced upon his return to Russia, where he traveled to assuage Russians angry over the government money grab. Russian oligarchs are thought to have deposited large amounts of their money in Cyprus because of the island nation's lax banking rules. Ekathimerini said Sarris no longer enjoys the support of Russia nor of Anastasiades, though the news service also reported that Sarris is denying these reports. Today Cyprus, Tomorrow Italy Or Spain?